Length: 39.9 metre Shipyard: Bodrum Oguz Marin Exterior/interior design: Bodrum Oguz Marin/ K Architects Launched in 2015, Rox Star has rock n' roll infused in her artwork, furniture and fittings. With accommodation for 10 guests and six crew, Rox Star features a fully battened main and mizzen ketch rig and more than 600 square metres of eye-catching black sails. Her master stateroom comes equipped with a king-size bed beneath a skylight roof, as well as a steam room. The remaining four guest suites all offer ensuite, Italian bathrooms and marble showers. Launched in 2015, Rox Star has rock n' roll infused in her artwork, furniture and fittings. With accommodation for 10 guests and six crew, Rox Star features a fully battened main and mizzen ketch rig and more than 600 square metres of eye-catching black sails. Her master stateroom comes equipped with a king-size bed beneath a skylight roof, as well as a steam room. The remaining four guest suites all offer ensuite, Italian bathrooms and marble showers. Length: 62m Shipyard: Holland Jachtbouw Exterior/interior design: Hoek Naval Architects/Ruiter Quality Interiors Claiming the title of the world’s largest privately owned two-masted schooner, the 62 metre Athos was listed for sale earlier this year for an asking price of €35,000,000. Built in aluminium by Dutch yard Holland Jachtbouw to a design by Hoek Naval Architects, Athos was delivered in 2006 and underwent a refit in 2016, which saw her hull transformed from blue to stark white. Accommodation in her mahogany panelled interior is for up to 10 guests in five cabins while the crew quarters also accommodate a staff of 10. 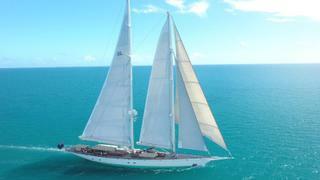 Claiming the title of the world’s largest privately owned two-masted schooner, the 62 metre Athos was listed for sale earlier this year for an asking price of €35,000,000. Built in aluminium by Dutch yard Holland Jachtbouw to a design by Hoek Naval Architects, Athos was delivered in 2006 and underwent a refit in 2016, which saw her hull transformed from blue to stark white. Accommodation in her mahogany panelled interior is for up to 10 guests in five cabins while the crew quarters also accommodate a staff of 10. Length: 64.5m Shipyard: Dream Ship Victory Exterior/interior design: Dykstra Naval Architects/Ken Freivokh Design Recipient of the Neptune trophy at the 2014 World Superyacht Awards, Mikhail S. Vorontsov was listed for sale last year for €40,000,000. Delivered in 2013, the three-masted schooner was built in laminated mahogany on steel frames by Turkish yard Dream Ship Victory. Her ultra-luxurious interior accommodates 12 guests in five cabins and includes a games table, bar and grand double doors leading to the deckhouse saloon area. 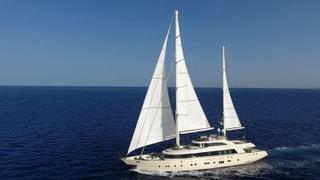 Recipient of the Neptune trophy at the 2014 World Superyacht Awards, Mikhail S. Vorontsov was listed for sale last year for €40,000,000. 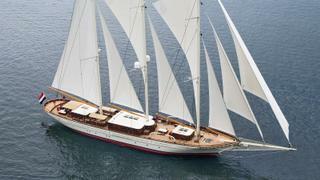 Delivered in 2013, the three-masted schooner was built in laminated mahogany on steel frames by Turkish yard Dream Ship Victory. Her ultra-luxurious interior accommodates 12 guests in five cabins and includes a games table, bar and grand double doors leading to the deckhouse saloon area. Length: 51m Shipyard: Aresteas Yachting Exterior/interior design: KYD Fuat Turan/Ridade Tuncel & Aldo Vianni This 51 metre yacht is one of the largest wooden constructed superyachts built in recent years and features dining and lounge areas inside with a cinema room and spa centre. Stand-out outdoor features include multiple sunbathing platforms and a Jacuzzi. Delivered in 2017 by Aresteas Yachting, Aresteas features naval architecture by KYD Fuat Turan and an interior by Ridade Tuncel & Aldo Vianni. This 51 metre yacht is one of the largest wooden constructed superyachts built in recent years and features dining and lounge areas inside with a cinema room and spa centre. Stand-out outdoor features include multiple sunbathing platforms and a Jacuzzi. Delivered in 2017 by Aresteas Yachting, Aresteas features naval architecture by KYD Fuat Turan and an interior by Ridade Tuncel & Aldo Vianni. Length: 42.25m Shipyard: Pendennis Exterior/interior design: Hoek Design The second hull in Pendennis' Truly Classic 128 range, Vijonara has been extensively customised for her experienced owner, starting with moving the helm forward of the aft deckhouse, creating a congenial spot for the helmsman to be close to the guests as well as a private cockpit aft that becomes an extension of the owner’s cabin. 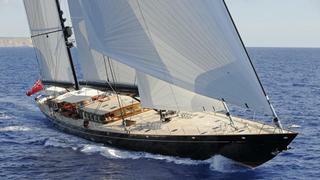 Vijonara's bowsprit housing the downwind sails is also a new addition. Inside, the highly detailed interior includes bespoke pieces crafted by Hermès. The second hull in Pendennis' Truly Classic 128 range, Vijonara has been extensively customised for her experienced owner, starting with moving the helm forward of the aft deckhouse, creating a congenial spot for the helmsman to be close to the guests as well as a private cockpit aft that becomes an extension of the owner’s cabin. Vijonara's bowsprit housing the downwind sails is also a new addition. Inside, the highly detailed interior includes bespoke pieces crafted by Hermès. 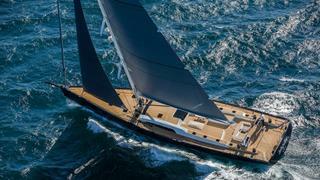 Length: 35.2m Shipyard: Nautor’s Swan Exterior/interior design: German Frers /deVosdeVries design Enrico Chieffi, Nautor’s Swan’s vice-president, says she’s the most technologically advanced boat ever built at Nautor. Hull No 4 of the Swan 115 was three years in the making and the result is a yacht able to compete on the world racing stage. Displacing 76 tonnes light ship, Odin will be able to attain very high speeds, especially when reaching and running. This is matched by a comfortable interior for cruising. Enrico Chieffi, Nautor’s Swan’s vice-president, says she’s the most technologically advanced boat ever built at Nautor. Hull No 4 of the Swan 115 was three years in the making and the result is a yacht able to compete on the world racing stage. 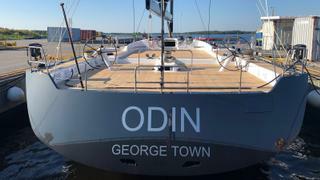 Displacing 76 tonnes light ship, Odin will be able to attain very high speeds, especially when reaching and running. This is matched by a comfortable interior for cruising. Length: 34.59m Shipyard: Southern Wind Shipyard Naval Architect: Farr Yacht Design Exterior/interior design: Nauta Design A comfortable superyacht with a touch of race boat, the new SW105 is a high-performance cruiser. Satisfaction, the first hull in the mini-series, features a raised saloon configuration with a low-profile coachroof. There are good sightlines over it, and inside, the high ceiling creates an airy, bright saloon. Wide aft sections and an open transom give ample deck space and extra volume below. A comfortable superyacht with a touch of race boat, the new SW105 is a high-performance cruiser. Satisfaction, the first hull in the mini-series, features a raised saloon configuration with a low-profile coachroof. There are good sightlines over it, and inside, the high ceiling creates an airy, bright saloon. Wide aft sections and an open transom give ample deck space and extra volume below. 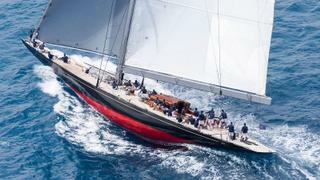 Length: 39.95m Shipyard: Holland Jachtbouw Exterior/interior design: Dykstra Naval Architects/ DeVosdeVries Design Designed by William Starling Burgess and built by Herreshoff in the USA, the original J-class sailing yacht Rainbow won the America’s Cup in 1934. 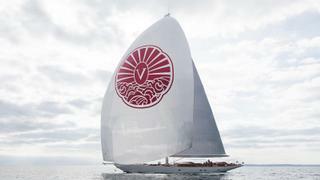 Built by Dutch yard Holland Jachtbouw in aluminium with delivery in 2012, this 39.95 metre Rainbow replica is based on the original design, with a modern update from Dykstra Naval Architects. Currently for sale for €10,500,000 with Yachting Partners International, guest accommodation is in three cabins consisting of a master suite, double and twin with two Pullman berths. Designed by William Starling Burgess and built by Herreshoff in the USA, the original J-class sailing yacht Rainbow won the America’s Cup in 1934. Built by Dutch yard Holland Jachtbouw in aluminium with delivery in 2012, this 39.95 metre Rainbow replica is based on the original design, with a modern update from Dykstra Naval Architects. Currently for sale for €10,500,000 with Yachting Partners International, guest accommodation is in three cabins consisting of a master suite, double and twin with two Pullman berths. Length: 54.6m Shipyard: Vitters Exterior/interior design: Hoek Design Naval Architects/ David Easton Built in Alustar by Vitters to a design by Hoek Design, the 54.6 metre sailing yacht Marie was launched in 2010. Currently for sale for $28,500,000 with Fraser, Marie accommodates up to 10 guests in four cabins comprising a large master suite with a king size bed and his and hers en-suite bathrooms, a VIP suite also with a king size bed, plus a port and starboard twin and all cabins have en-suite facilities. 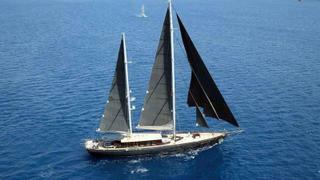 Built in Alustar by Vitters to a design by Hoek Design, the 54.6 metre sailing yacht Marie was launched in 2010. Currently for sale for $28,500,000 with Fraser, Marie accommodates up to 10 guests in four cabins comprising a large master suite with a king size bed and his and hers en-suite bathrooms, a VIP suite also with a king size bed, plus a port and starboard twin and all cabins have en-suite facilities.